A Beautiful Ukrainian Perspective: How Can I Be Useful to the Lord? Sunday I attended church in Hangzhou where we had a wonderful sacrament meeting that included a young couple from Ukraine who were the concluding speakers. The talk by the young Ukrainian woman was uplifting and beautiful. My favorite part was her story of an LDS man in her congregation in Ukraine who was born with some severe physical problems that made it difficult for him to walk. In fact, she told me after the talk, the doctors had said that he would never walk, but as his faith grew while still a young child be believed that he could and needed to, and taught himself to walk around age five (I may have details wrong here--will try to check later). His physical limitations were still so severe, though, that it seemed unlikely that he could serve on a regular mission, but he really wanted to serve and applied to serve anyway. If I understood correctly, it would require special permission from Salt Lake, and he was elated when it came and his application to serve was accepted. He served in Russia, as I recall, and inspired everyone by being one of the hardest working missionaries. He helped bring people into the Church and inspired members and missionaries in his mission and at home. He continues to inspire others today. She asked the man why he wanted to sacrifice so much to go serve a mission. His answer: "I want to be useful to the Lord." Those words struck me deeply. Many times I finding myself struggling with the wrong goals, struggling to know which direction to pursue. I think that Ukrainian perspective could help bring more clarity by asking, "How can I be more useful to the Lord?" I was also inspired by her husband's talk. I had spoken with him before the sacrament meeting and was impressed with how kind and friendly he was. But I knew he was uneasy with English. His English is excellent, but sometimes he struggles. As he began speaking, it was clear that the pressure of speaking to a group added to his burden. After a couple of minutes, he turned to a woman on the front row and said something to her. I was surprised to see her jump up, hand a baby to her husband who was on the stand, and stand next to the speaker. I had met the woman before and had recently seen her and her husband in a video that a non-LDS Chinese man is making to help bring lessons from their positive example of parenting and family love to strengthen other families in China. From that video, I knew she could speak Chinese pretty well in addition to her native English. But then the Ukrainian man began speaking in Russian, and she translated into English. Suddenly a good talk became much more interesting. Subtle points and emotion were more easily conveyed. She even choked up at part of his talk, and so did I. Yes, she had served a Russian-speaking mission in Georgia, near Chechnya. Her Russian is still pretty good, it seems. When I talked to her afterwards, I learned that I was not the only one who had a prayer in their heart for this good man as he spoke. She had been praying in her heart for him, for she knew of his fears and nervousness. She prayed that his message might be conveyed, that people might understand and be touched. As with many prayers on behalf of others, those offering the prayer frequently become part of the miracle. Many thanks to the beautiful Latter-day Saints of Ukraine. May we all pray for Ukraine. May we pray for others around us as well. Imagine what life would be like if the people next to us on the subway, in the halls at school, on the streets, in our homes, and in our congregations were more likely to be praying for us than ignoring, mocking, or criticizing us. One of my favorite books on China portrays Chinese history in the past 120 years through the experiences of a remarkable family. The book, China Mission: A Personal History from the Last Imperial Dynasty to the People's Republic (Louisiana State Univ. Press, 2013) begins and primarily focuses on the life and work of Reverend Halvor Ronning, a Norwegian immigrant to the United States who was inspired to become a missionary in the interior of China. In 1891, the tall minister, his sister Thea, and fellow missionary Hannah Rorem boldly enter a land of sorrow and tragedy coupled with charm and wonder, where their work of service, faith, and love is sorely needed. They found a Lutheran mission and school in Hubei province and put their lives at risk in many ways to serve God and bless China. The story of their lives and the lives of their descendants reveals much about China and the role it now plays in the world. Many will benefit from the account of the Ronning clan, though toward the end of the book when the rise of Mao is described, some may be offended by the author's biases which result in a not-very nuanced account with Communists being described as rather saintly while the Nationalists are nothing but villains. But regardless of where you stand on such matters, the personal experiences of the Ronnings around the turn of the century present an amazingly gritty and touching portrayal of a life of faith in China during some of its most pivotal moments. The book has much to say on matters of faith and the cause of Christianity in China. I will have more to say about that later. For now, I wish to focus on the remarkable example of Halvor Ronning in his life of faith, seeking to love the people of China even when they made life difficult for him. An account that especially touched and surprised me happened as he and his family had to flee China during the Boxer rebellion that began in 1898. The Boxers were a secret society, or a coalition of many secret societies that had spread across China. A key theme of the Boxers was blaming the ills of China on foreigners. They were certainly right in some ways. The great evil of opium and the many concessions forced upon China by the British and other nations were outrages. Unfortunately, the Boxers were not interested in distinguishing between helpful and vile foreign elements. Their approach ultimately became rather one-dimensional: "Kill the foreign devils." The source of so much of China's troubles, the Empress Dowager, a concubine of the former emperor who through murder, conspiracy, and brutality had seized power of China, exploited the Boxers to maintain power and echoed the Boxers' call with an official government decree: "Kill the foreign devils." It was an extermination order, China style. As the family was getting into the boat during the night, a group of Boxers came running to attack. Halvor had the women and children go below deck to hide while he and two other missionary men tried to ward off the Boxers. About ten of them swarmed onto the tiny boat. Halvor wielded an oar and used all his might to defend his family. His wife, Hannah, grabbed a stool and came up swinging to defend her family also. But there was little hope of surviving this mob. Halvor was then hit in the chest with a stone thrown from the shore and was knocked on his back. Then a Boxer jumped on him, but Halvor intercepted the Boxer with his feet, suspending the Boxer in the air, and then with a swift kick threw the Boxer off him, tossing him overboard into the river. Very few Chinese people could swim then or now. The man in the water let out a scream of terror as he began drowning and then went underwater. The fighting stopped as everyone looked at the hopeless scene. At this moment, I thought, "Ah, there's the key! Knock them all into the water!" God bless him, that wonderful saint, Halvor Ronning, had a different idea that shows me who he really was. He was not a Viking seeking to fight his enemies, but a man of God who loved even those who wanted to ill him. Instead of pushing more Chinese men into the river as the turned to watch, he dived into the him and went below, seeking for the dying man who moments earlier had tried to kill him. Eventually he came up, dragging the unconscious Boxer with him. He brought the man to shore, and his fellow missionary, Dr. Thorstein Himle, jumped to shore to help resuscitate the man. There was no response. The Boxers all gathered around. As resuscitation efforts were applied, the Boxers cried out that the foreigners were trying to kill the man. But they waited and watched. They began talking about the best ways to kill these foreigners. Should they roast them? Flay them? Halvor knew that if the man died, they would all be killed. Appealing to God for help, they continued doing all they could. Suddenly the man revived. For Halvor and the missionaries, it was a miracle from God, and they gave thanks. The Boxers claimed it was proof of their invulnerability, not recognizing the source of the miracle they had witnessed. But with the distraction created by the revival, the missionaries were able to jump back on board and cast off, their lives spared. What a remarkable man. Having just finished this book, I feel that Halvor and Hannah Ronning are family members. How I admire them and look forward to meeting them someday. God bless them for their service to China. They understood that every soul matters, that every human being is a son and daughter of God, not a statistic. An increasing number of friends are reporting troubling cases of theft from their China bank accounts. One friend, after years of working in China and saving every penny, was preparing to return to the US, but suddenly every penny in her ICBC bank account was stolen. ICBC may be the world's largest bank. I think it is the most popular one here in China, where most of the world's money seems to be coming these days. In spite of all the great technology that ICBC must have, someone was able to take out every penny with no warning. The ICBC bank officials told her that someone had a copy of her card and had taken the money out. She asked how this was possible without knowing her password. No explanation was given, except that it was somehow her fault. She spent five days arguing with them and got nowhere. They said that the thief could have been working with her to perpetuate fraud on the bank, so why should they refund her money? Her only option now is to sue, but she has to go back to the US soon and fears she won't have the ability to pursue the case. But we've encouraged her to work with a lawyer to fight this and are trying to help. She will fight and has a lawyer taking action. I hope to have good news to report sometime. Her story has almost exactly the same set of facts that we find in a chilling account, "How I sued the world's largest bank and won" at Shanghaist.com. In that case, it was a smaller amount, 15,000 RMB that was taken from the author's ICBC account. He encountered the same consumer service policies and attitudes, and was forced also to sue for something that was clearly not his fault. He won, and it only took 7 months and some modest attorney fees to get his money back. If you have a bank account with an ATM card, there is a real risk that one day money will begin disappearing from your account. This happened to us with our US bank. Someone in Germany was taking out $300 a day for 3 days in a row before I logged in and notice this. Because the German bank providing the ATM was not able to document that our password had been used to make the withdrawals, it was their fault and they had to refund the money into our account. But I am amazed that the money could be taken out at all without our password. It happened! Check your account frequently. 3) Banks in China often don't have effective anti-fraud protection. 5) Thieves can sometimes pull money out of your account without using your password. I don't know how this happens, but it has happened to multiple people in China, and it happened to us with our US bank. 6) When someone pulls money out of your account without knowing your password, it should be the bank's fault and they should reimburse you. But consumer service attitudes and policies may not be identical to those in your home country. China banks may tend to blame the customer and argue that maybe the thief was collaborating with you, so they might not cooperate unless you take them to court. You can sue and win in China, but it will take a lot of work and the help of an attorney. 6) Keep good records of where you have been so that if the bank says it must have been you that pulled all your money out of your account in, say, Harbin, you can prove you weren't in Harbin that day. 8) When you do find a problem, document in detail who you spoke with, what you said, what they said, etc. You may needs lots of documented details if you have to sue the bank to get back missing money. If you do online banking, your risks are also high due to hackers. I suggest you use complex passwords that you change often, and only use secure computers to access your bank accounts. It's good to have a cheap computer that is never used for browsing but only for bank access, and even then keep good firewall and anti-spyware software on it, keep it updated, use more secure browsers like Chrome or Firefox, and don't use untrusted wifi networks to access your accounts. For added security, use VPN when you access your bank account. This encrypts all the information, although using the typical https connection should do that also. Don't keep all your money in any one account, and keep a wad of cash somewhere, too. Thieves can get everything, but we shouldn't make it easy for them. That would seem to be part of a sound approach to "provident living." I was sure the simple instructions were wrong as I assembled the frame for the Casio electric piano I purchased for my wife for Mother's Day. When it came time to add the pedal assembly, the instructions called for removing two screws holding a metal bracket in place on each of the side panels, and instead of the two screws one big screw would be put in place that was supposed to hold a bracket that could connect to the beam holding the pedals. But it made no sense, because the bracket would only just sit on top of the big metal screw and let the whole pedal beam wobble. It seemed like the bracket was defective. My wife encouraged me to just plod ahead and stick with the instructions. It was only at the last step, when the big metal screw was tightened, that I could see how the system worked. It pulled a part of the metal frame in tightly to compress the wobbly bracket and hold it firmly in place. The system was actually pretty clever. It was only after following the instructions through to the end that everything finally made sense. The instructions were good, though they lacked (unnecessary) explanation to allay my concerns along the way. That experience came around the same time I was reviewing some of the typical critical complaints about the mysterious barges of the Jaredites in the Book of Ether, chapters 2, 3, and 6. As with Noah's ark, we really don't know many details and have to wonder how much of the original record has actually been preserved and interpreted correctly. In the Jaredite story, we have a record passed on from Jaredite culture to the Nephites, and then on to us in telegraphic form. There are opportunities for a lot of helpful details to be lost. Along the way, it's fair to question the assumptions we bring to the text. Some LDS folks as well as critics have imported a number of assumptions. The idea of the ships turning upside down in the water is one that I don't think is justified. These ships were peaked at the ends and had a top and a bottom. They may have been covered with waves from time to time, but nothing requires them to go upside down, though there would be some encounters with monster waves. Another possibly errant assumption is that modern glass windows are meant in Ether 2:23 when the Lord explains that they barges can't have windows for they would be dashed in pieces by the waves. A fair question is what exactly would be dashed to pieces, the windows or the barges themselves? 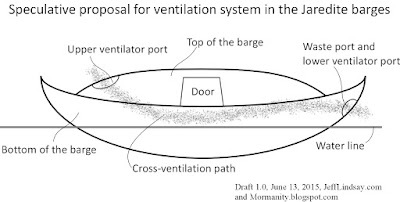 I assume the windows are meant, but John Tvedtnes explains why this could refer to the barges themselves being at risk if the structure were weakened with multiple windows. In either case, glass panes are not required here. If the windows themselves are meant, as I've always assumed, other writers have noted that the warning about something being destroyed could simply refer to a window with wooden shutters. Whether wooden shutters or openings with translucent materials (fabric, parchment, etc.) were what the Jaredites understood, they would be a weak structure that would not be wise for the ships. 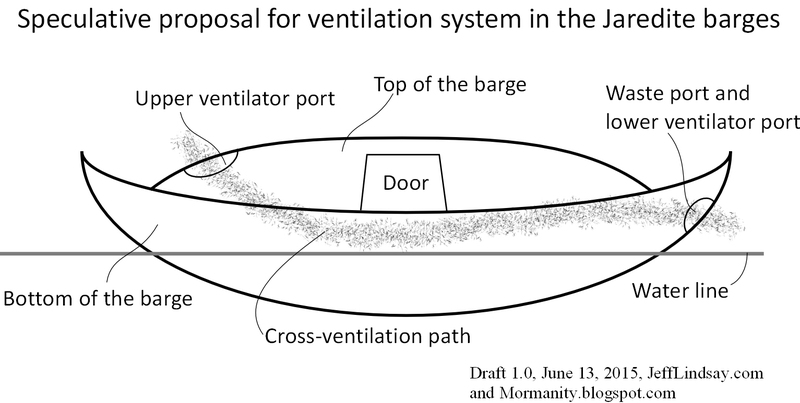 Apparently small ports related to ventilation would be added that could be "stopped" with some kind of seal, unlike the action of shutters on a window. I'll discuss the important detail of ventilation below. Some critics have also wondered how on earth the Jaredites would not recognize the problems of lighting and ventilation until after the barges were completed, resulted in the brother of Jared's prayer to the Lord in Ether 3 in which he presents the problem. Wouldn't experienced barge builders have noticed that right away and raised the objection early? Yes, that's a reasonable question. I don't know the answer to that, but it may be that there were several components to the barges, and the final internal situation only became clear as the parts were brought together in the final assembly. For example, there may have been top sections which were added to the main bottom section in the end, and only then did it become clear that they had a problem. As with my electric piano assembly, a lot of things might not have made sense until they acted in faith and saw, several steps later, how things worked. Maybe they were expecting the final step to resolve the problems they might have been worrying about all along. When the disappointment came, all that was left was more faith and prayer, resulting in the real final instructions that did, in fact, resolve the problems. The instructions may have come in stages, not all at once, so there might have been no reason to worry as they constructed the ship because they expected more instructions to keep on coming until everything made sense. Whatever the sequence of events, the Jaredites did reach what seemed like the final stage of construction and were faced with unresolved problems: no light, bad ventilation. Now what? The result of Ether 3 is that the Jaredites received miraculous glowing stones that would provide light for the journey. Were these radioluminescent materials? We don't know, but the concept of brightly glowing materials is no longer scientifically ludicrous. Interestingly, there are ancient Jewish traditions about Noah also receiving glowing materials for the ark. And it came to pass that the brother of Jared cried unto the Lord, saying: O Lord, I have performed the work which thou hast commanded me, and I have made the barges according as thou hast directed me. And the Lord said unto the brother of Jared: Behold, thou shalt make a hole in the top, and also in the bottom; and when thou shalt suffer for air thou shalt unstop the hole and receive air. And if it be so that the water come in upon thee, behold, ye shall stop the hole, that ye may not perish in the flood. It is commonly assumed that the hole in the bottom is a hole below the water line. Some have proposed that it could have been a moon pool, and I personally long assumed it was an opening below the water line but with impermeable sides rising above the water line defining a moon pool that did not require elevated air pressure and that could be used to dump waste or even catch fish. But how would that help with ventilation? The barges the Jaredites built for their travels before they crossed the ocean may have been similar, but without the sealed top portion. The top may have been assembled and locked into place in a final step that led to the sudden realization that they still had a serious problem. It is also possible that both the top and bottom were crafted with sections that made it easy to add the final ports without just hacking away at the solid hull. But for both ports, when waves were high, there was the risk of water coming in, so being able to quickly stop the port was needed. They may have been hinged or completely removable. One issue the Brother of Jared raised when he asked about lighting was steering. He wanted to see to know how to steer (Ether 2:19). Perhaps there was some mechanism for steering, such as a rudder, and so he wanted to be able to see to know how to steer. The issue of steering is not addressed after that, but perhaps it was resolved and not spelled out in the brief description we have. Maybe the upper port or both ports together provided enough visual access to guide the boats to keep them together (others have speculated that they may have been roped together, although that could be a liability when dealing with big waves and heavy storms). OK, I really don't know, and there are still many aspects of this story that are unresolved. But my experience with a confusing electric piano reminds me that many details in instructions as well as written descriptions might not make sense at first. What we are given may not be enough to understand the details and resolve our confusion, and these simple accounts of complex ancient voyages are likely to be that way. We can give up in exasperation, or move forward with faith and patience. In the end, that worked for my piano and I think it worked for the Jaredites. Hugh Nibley, "Strange Ships and Shining Stones"
One of the earliest Christian writers after the New Testament era was Clement of Alexandria, who lived from about 150 to 210 AD. While researching the concept of the "yoke of Christ" in Matthew 11:28-30, I noted that Clement makes a connection between the yoke and rites of initiation and other mysteries aimed at bringing us into the presence of God and becoming more like him. Come, O madman, not leaning on the thyrsus, not crowned with ivy; throw away the mitre, throw away the fawn-skin; come to thy senses. I will show thee the Word, and the mysteries of the Word, expounding them after thine own fashion. This is the mountain beloved of God, not the subject of tragedies like Cithæron, but consecrated to dramas of the truth,--a mount of sobriety, shaded with forests of purity; and there revel on it not the Mænades, the sisters of Semele, who was struck by the thunderbolt, practising in their initiatory rites unholy division of flesh, but the daughters of God, the fair lambs, who celebrate the holy rites of the Word, raising a sober choral dance. The righteous are the chorus; the music is a hymn of the King of the universe. The maidens strike the lyre, the angels praise, the prophets speak; the sound of music issues forth, they run and pursue the jubilant band; those that are called make haste, eagerly desiring to receive the Father. Come thou also, O aged man, leaving Thebes, and casting away from thee both divination and Bacchic frenzy, allow thyself to be led to the truth. I give thee the staff [of the cross] on which to lean. Haste, Tiresias; believe, and thou wilt see. Christ, by whom the eyes of the blind recover sight, will shed on thee a light brighter than the sun; night will flee from thee, fire will fear, death will be gone; thou, old man, who saw not Thebes, shalt see the heavens. O truly sacred mysteries! O stainless light! My way is lighted with torches, and I survey the heavens and God; I become holy whilst I am initiated. The Lord is the hierophant [that which brings someone into the presence of the holy, like the keeper of the gate in 2 Nephi 9], and seals while illuminating him who is initiated, and presents to the Father him who believes, to be kept safe for ever. Such are the reveries of my mysteries. If it is thy wish, be thou also initiated; and thou shall join the choir along with angels around the unbegotten and indestructible and the only true God, the Word of God, raising the hymn with us. This Jesus, who is eternal, the one great High Priest of the one God, and of His Father, prays for and exhorts men. Let us haste, let us run, my fellow-men—us, who are God-loving and God-like images of the Word. Let us haste, let us run, let us take His yoke, let us receive, to conduct us to immortality, the good charioteer of men. Let us love Christ. He led the colt with its parent; and having yoked the team of humanity to God, directs His chariot to immortality, hastening clearly to fulfil, by driving now into heaven, what He shadowed forth before by riding into Jerusalem. A spectacle most beautiful to the Father is the eternal Son crowned with victory. Let us aspire, then, after what is good; let us become God-loving men, and obtain the greatest of all things which are incapable of being harmed—God and life. Our helper is the Word; let us put confidence in Him; … There is therefore no room to doubt, the Word will say, whether it is better to be sane or insane; but holding on to truth with our teeth, we must with all our might follow God, and in the exercise of wisdom regard all things to be, as they are, His; and besides, having learned that we are the most excellent of His possessions, let us commit ourselves to God, loving the Lord God, and regarding this as our business all our life long. And if what belongs to friends be reckoned common property, and man be the friend of God—for through the mediation of the Word has he been made the friend of God—then accordingly all things become man’s, because all things are God’s, and the common property of both the friends, God and man. It is time, then, for us to say that the pious Christian alone is rich and wise, and of noble birth, and thus call and believe him to be God’s image, and also His likeness, having become righteous and holy and wise by Jesus Christ, and so far already like God. Accordingly this grace is indicated by the prophet, when he says, “I said that ye are gods, and all sons of the Highest.” For us, yea us, He has adopted, and wishes to be called the Father of us alone, not of the unbelieving. Such is then our position who are the attendants of Christ. There is much in Clement that resonates with LDS concepts. Many things to discuss later. But some have argued that since Paul speaks of adoption, it means that we aren't actual, literal children of God, but rather that we are an entirely different species. Only Christ is "begotten" or descended from God, and the rest of us are entirely distinct and in need of being adopted. [Here I delete my errant discussion based on misreading an unclear part of the text, where I thought it said "was adopted" instead of "has adopted." Oops!] But perhaps Clement of Alexandria helps us overcome that barrier to recognizing our divine inheritance, for he teaches in the last paragraph quoted above that Christ in His role as Son of God also was "adopted." Adopted for us to bring us back to God. My guess is that the concept of adoption in this context means putting off the natural man and fully accepting God, thus being accepted of God, that we may enter into God's presence in a covenant relationship to receive His kingdom and all that He has. We are sons and daughters of God, with the potential to become true Sons and Daughters of God in His kingdom, joint heirs with Christ. Heavy material, certainly, but worth thinking about. I'd like to know more about the mysteries that Clement knew.